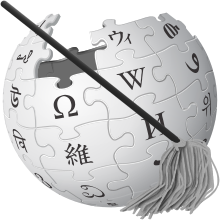 This is the symbol of a Wikipedia administrator. It shows the site's logo with a mop, as administrators are often linked to janitors. Administrators, also called admins or sysops (system operators), are users who can use special tools that help keep Wikipedia running well. They can use these tools because they are trusted by the community, but this does not make them better or more important than anybody else. The opinion of an administrator, for example, should not be counted as more important than the opinion of a person who chooses to change Wikipedia with an IP address just because they have administrator rights. There are currently 17 administrators. They can delete and undelete pages. Pages can be deleted because of a request for deletion or they can be quickly deleted under policy. Undeletion requests should be made at Wikipedia:Requests for undeletion. Administrators can also hide revisions of a page from public view by deleting them. Only other administrators can see the deleted revisions. Revisions should only be hidden in special cases, listed here. Requests for protection can be made at Wikipedia:Administrators' noticeboard. Please remember that pages are usually protected when there is vandalism or an edit war happening, and not to prevent vandalism that has not happened. Administrators can block and unblock users who are causing trouble. Requests should be made at Wikipedia:Vandalism in progress but only if the user has been disruptive. Requests made in bad faith may result in you yourself being blocked. Blocks are different than bans. To use bot rollback, you type in the URL http://simple.wikipedia.org/w/index.php?title=Special:Contributions&target=Example&bot=1 replacing Example with the user name, and then you can rollback changes and hide them from the recent changes along with the rolled back edit, but this should only be used for large amounts of vandalism, like with a vandalbot. Users can also be given the rollback tool. You can make requests at requests for rollback. They can import pages from other Wikipedias. They can see which pages are not on anyone's watchlist. They can give some user rights to others. They can add or remove rollback, IP block exempt, flooder, the uploader right, and the patroller right for all accounts. Bureaucrats can do a few more things than an administrator, but they should only use these while acting on consensus. Bureaucrats can give administrator or bureaucrat rights to other users, following a successful request on Wikipedia:Requests for permissions. On the Simple English Wikipedia, bureaucrats can also remove administrator status following a successful request for removal of rights (deadminship), or in certain emergency situations for protection of the wiki. They can also "flag" and un-flag bots, which means to hide their contributions from the new changes and put them in the bot group. Bureaucrats were previously able to help users who want to change their username. These requests were handled on Wikipedia:Changing username. However, the ability to rename users has been removed from bureaucrats for SUL finalization. Now, these requests should be made at Meta-Wiki or on this special page where stewards and global renamers will handle them. A select few administrators are also CheckUsers. Users with CheckUser access can see the IP addresses of named editors. They can also see which users edit from certain IP addresses, as well as some information on the browser used for editing. There are many rules as to who can become a CheckUser, and how CheckUsers have to behave. These rules are listed on the CheckUser policy page. CheckUsers can help fight vandalism and sock puppetry this way. CheckUser requests can be made at Wikipedia:Requests for checkuser. Certain administrators are also Oversighters. Page revisions can be hidden or removed from the public history so they can only be seen by other oversighters, stewards, and developers; users with oversight access can hide revisions so that only these users can see them. The right is a sensitive one, and removes private data that can cause legal problems. There are many rules as to who can become an oversighter, and how oversighters have to behave. These rules are listed on the Oversighter policy page. Oversighters can help fight vandalism this way. Oversighter requests should only be made privately, and not on Wikipedia. See the Oversighter page. An automated list of accounts with administrator rights is available at Special:ListAdmins. Users who want to request administrator, bureaucrat, checkuser or oversighter rights can do this at Wikipedia:Requests for permissions. Note that only administrators can become bureaucrats, checkusers or oversighters. This page was last changed on 22 March 2019, at 17:57.